How Does Credit Card processing work ONLINE? There’s millions of business all taking credit card payments every day using custom payment pages, mobile apps, accounting software, ecommerce websites, Crm tools, invoicing software, hosted payment pages, wordpress, payment gateways, woocommerce, wix, Squarespace, Paypal Links, and I think you get the idea…. There’s lots of payment options. Today I’m going to show you how it all works AND I’m going to give you a resource for finding the best way to accept credit cards ONLINE for YOUR business. We’re gonna focus on the online transaction flow. I’m talking about what happens with YOUR website, payment pages, payment gateways and CRM softwares when a transaction takes place. So in short, this is the process of how you can get a payment from your customers credit card, to your bank account… ONLINE … and everything that happens in between that. I outlined the basic transaction flow in previous videos, but here’s a quick recap. You start with a customer who is perhaps shopping on your website, or somehow making a payment from a payment page that you have set up. We’ll getting into the Page options later, but for now, just assume that it’s a payment page on your website. Once your customer clicks SUBMIT the Payment gateway goes to work and sends the secure data over to the credit card processing company for approval. During this process, the VISA/MC payment networks are used and the Card Issuing bank either approves or rejects the transaction based on cardholder funds available. Then an approval code is sent back through the same networks to the processing company who tells your Payment Gateway to approve the transaction and send your customer to the “Thank you” page for confirmation of a successful transaction! Then the Card Issuing bank charges your customers bank account and sends the money to the Processing company so YOU can get paid immediatley. The last step in that transaction cycle is that the Card Issuing bank sends the credit card statement (i.e. the bill) to your customer to pay. But we’re staying online today. So here’s your business and here’s the website that you’re selling your products and services on. One small piece of your website is a single payment page and behind that payment page, is a Payment Gateway, that is offered through your merchant account provider. Stripe has an integrated Payment Gateway, but we won’t get into comparisons of merchant accounts or payment processors here. There’s links in the description for a detailed video that discusses the difference between Merchant Accounts and PayPal, Stripe, and Square so click and watch if that’s of interest to you. Every time a customer checks out and buys something from your online store, the payment gateway goes to work and starts that transaction flow that we just outlined. So here’s the major components of how this works online, so you know what’s possbile and what software will work for you. 3- the payment processor like First Data or CardConnect. And within each of those categories, there are 100’s and sometimes thousands of options. So I’m going to give you an example of a workflow that incorporates this online transaction flow and then give you a link to a series of videos called “Payment Workflows” where each video covers a specific “Customer Checkout Processes” using specific software and merchant account options so you can just take the blueprint and set it up in your business. This is where you showcase your products and/or services. You can add as many products as you want and it’s all made possibile by wordpress website building software AND number 2 on our list which is the Woocommerce plugin. 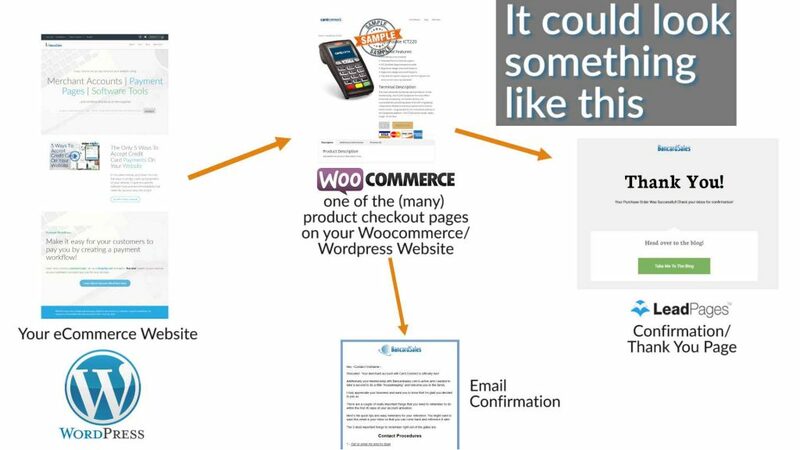 Woocommerce makes it possibile to have a “shopping” CART on your website and it also gives you the ability to plug in a payment gateway so you can connect your merchant account which we’ll get to in a second. With this plugin, it makes it much easier to connect the payment gateway and your merchant account because both of those power ecommerce portion of your website! 3- So, speaking of… the payment gateway is #3 on our list! The payment gateway is the workhorse behind the scenes. For a detailed explanation of the payment gateway, click the link on the screen or the link in the description. Number 4- The merchant account is set up with a provider like First Data and you connect your bank account to it so money can be deposited. When you set up a merchant account, you also set up a Payment Gateway account like CardPointe or Authorize.net. (#5) And finally, number FIVE is your bank account which is linked to your merchant account. Remember, that the merchant account, the payment gateway and your bank account are all different, but you need all of them for this workflow scenario. You plug the payment gateway into the woocommerce interface which is a plugin that is compatible with WordPress website building framework. That credit card transaction gets sent into the transaction flow which brings the merchant account into the picture and an authorization is sent back for approval… all within a second or so. And finally the merchant account sends the deposit to your bank account! Now, some Important things to note with this scenario, since we’re talking about payments online. 1.SSL is not only a good idea, some gateways will not work without it. Plus google loves SSL certificates so it’s a great idea to get one. Siteground offers FREE SSL CERTIFICATES with their hosting plans so if you’re in need of that, there’s a link in the description. 2. In order to initiate recurring payments, you need ANOTHER recurring billing plugin that is compatible with Woocommerce. Just search the WordPress marketplace for plugins for the recurring billing plugin. These are often premium plugins, which means there is a cost for them, most of the time so you might have a hard time finding a good, reliable recurring billing plugin, for free. 3. With a wordpress website in the configuration that I’ve outlined here, NO credit card DATA is stored on your website which is the way you want it to be for security purposes. 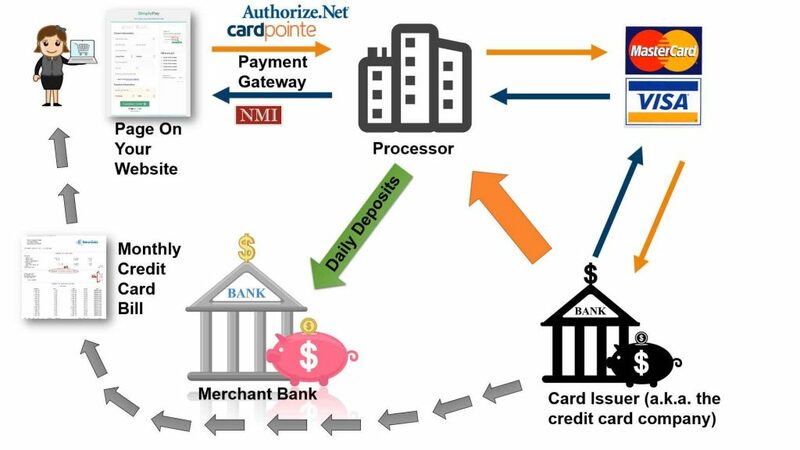 The gateway like Authorize.net or CardPointe take the transaction data and shields it by encrypting the data (card number and all) before it ever enters the transaction cycle. So as it’s out there floating around in the cyber networks, it’s absolutely protected just in case some really smart cyberthieves got ahold of the data. If you like this explanation of the customer checkout process, keep in mind that there are 100’s and thousands of different possibilities with all the different website builders, software tools and merchant account options. So be sure to check out the Payment Workflow video series that I talked about earlier. Each one of them outlines VERY SPECIFIC and exact software tools along WITH a Payment gateway and merchant account options for you to use in your business. So if you’re searching for a solution to put to use in your business, those videos will be perfect for you. If you’re new to my channel thanks WELCOME and thanks for watching! Please share this video with a friend or colleague who would benefit from this information and give this video a thumbs and comment below. It helps the video get found and helps others find this information too. And finally, be sure to subscribe so you don’t miss any new videos when they’re posted. I publish tutorial style trainings, how-to videos, and informational videos that are on the topics of payment pages, Merchant accounts, tech software tools AND payment workflows that tie all of them together!